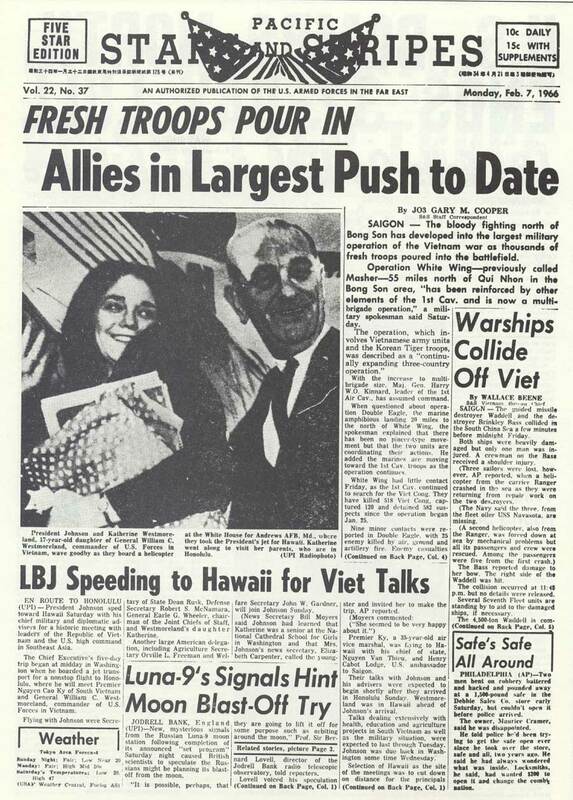 The 1st Cav (though not C 2/5 Cav in particular) make the front page of the Stars & Stripes as Operation Masher/White Wing gets bigger. 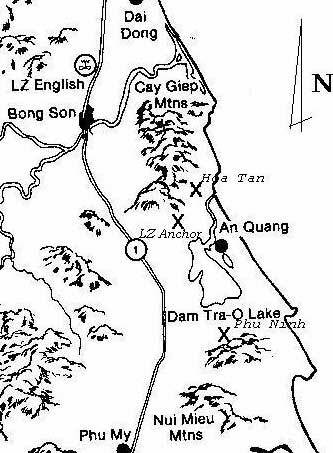 The operation, in and around the Bong Son plain in Binh Dinh Province, was the scene of many operations for C 2/5 Cav, until the division left the northern part of the Republic of Vietnam in the fall of 1968. Click on photo to see larger version. Caution: it may take over a minute to download. In the mountains west of the Bong Son plains was the Kim Son Valley - sometimes called the Crow's Foot because of the shape of the surrounding hills looked like a bird's foot.. This was some of the worst terrain imaginable: the hills were very steep, the jungle and underbrush very thick, and there were copious snakes and leaches. To make matters worse, February was a rainy season month, often making flying impossible for helicopters, and life miserable for grunts on the ground. 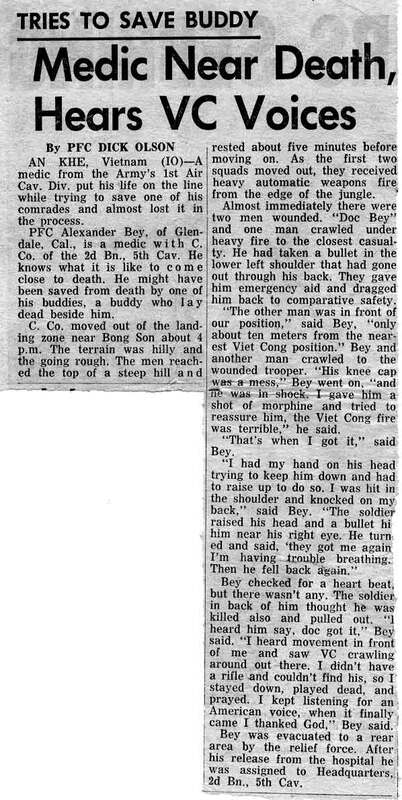 The enemy Quyet Chien or 18th NVA Regiment moved into the area after getting beat up badly elsewhere in Bong Son by other 1st Cav units. During the morning of February 16, the entire battalion was picked up at Pickup Zone Duck (It is not known if this was the same LZ Duck on the Bong Son plains just east of the mountains. It may not have been built yet. Anyone with the information, please contact the webmaster.) All companies were to CA into LZ Mike. (In those days, all landing zones were named, even it was just a field and there was no intention of staying there.) Charlie Company was the last to come in. The plan was for B Company to move to an area called LZ Pete and act as a blocking force, while A Company and C Company swept enemy forces into those blocking positions. (D Company was the Combat Support company at that time - this was before the addition of E Company.) B Company was unable to reach its objective that day, and spent the night in a defensive position. Paul Nunn recalls the creek was at the base of a very steep hill - steep enough that he slipped all the way to the top. He remembered " . . . . (we) got our butts hammered. We did take that hill but only when Charlie got tired of playing with us." Jim Mullen recalled in an email: We were crawling up a hill just before we got to LZ Pete trying to take out a machine gun, as I remember, and I guess they zeroed in on me and put a number of rounds it seemed the full length of my body about a foot away from me. I thought it was the guy behind me misfiring his weapon, so I yelled at him - but he said it wasn't him so we moved out quickly. Just lucky I guess. Killed in that fire fight were SSG Robert Lilly and PFC Douglas Wade. Parnell Bethune remembers SSG Lilly dying of a sucking chest wound, sustained while the company was attacking up a wooded hill. I can confirm that we all pulled out of the valley and waited on top of the hills/mountains and watched while the B-52's dropped their loads onto the valley. Afterwards we walked back through it and saw what was left. An awesome sight. The company was part of a larger blocking force at LZ Pete, but set out on patrols around 8 AM. An hour and a half later, the company found three dead Viet Cong, along with an American-made Browning automatic rifle and ammunition. Troopers also found 12 freshly dug bunkers, along with racks of cooking pots and some papers. The bunkers were destroyed. Sometime during the day, the entire battalion was extracted, with Charlie Company going to LZ Duck. No mention is made in the 1st Cav Div G3 logs of any contact, but the Morning Report of February 22nd indicates we had one KIA and one WIA on that date. The company was engaged in sharp combat during this time in the Kim Son Valley. During these fights, C 2/5 Cavalry lost some fine men: (All casualties are confirmed by the Morning Report of the appropriate date.) 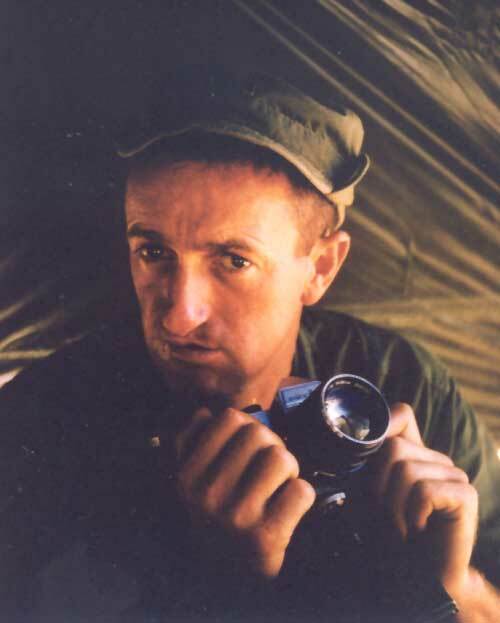 Jim Mullen was a Platoon Leader at that time, and remembers that many of the KIA and WIA happened when Charlie Company tried to get across a small creek to get into LZ Pete, and that one of the KIAs was a medic trying to protect a wounded trooper. If true, that medic would not be on the C Company Morning Report. Most likely, Jim's recollection would apply to February 17. CPT McMahon (B 2/5 Cav Commanding Officer) stated in his monograph that the entire battalion closed on LZ Pete that night.